85% of push notifications are viewed within 30 minutes of sending, compare this with email. 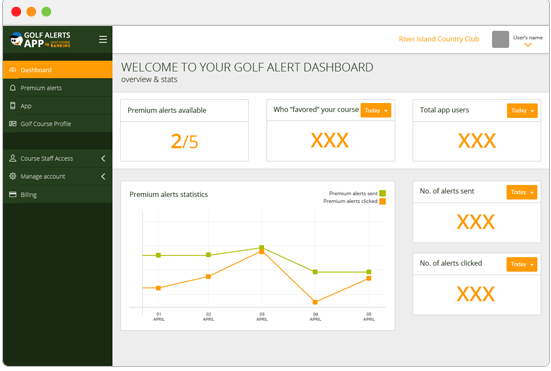 Push notifications place your message in front of your golfers, faster and more efficiently. With Golf Alerts you connect with your customers on their phones with push notifications. 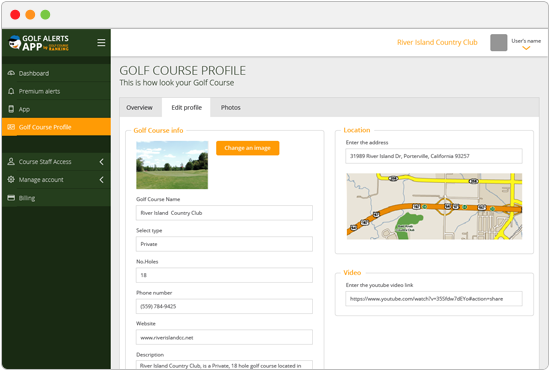 Once you register, you can begin registering golfers and sending push notification alerts. It's really that easy. Go to registration page, fill out the form and we will send you email confirmation and admin access. Log in and go to the Premium Alerts section. From here, you can send push notifications to your players. Golfers will receive your push on their always present smart phones. 85% viewed with 30 minutes verses 15-20% of emails viewed within 72 hours. When golfers see your alerts, golf is on their mind. If golf isn't on their mind, they won't be at your course. Keep your course information updated. Every day thousands of golfers look for courses on our website and app. It makes sense to update name changes and other course data should a change occur. It's easy. -Date they marked your courses as a "favorite"
Note: Golfers typically "favor" nearby courses and courses they are thinking of playing. Golf Connect program requires a $99 App Marketing Starter Package. The marketing package includes 2 banners, 200 postcards, and 500 business cards.